8% 6.00 Proving Grounds Chest. In the Keystone Citadel behind a gate in the Flooded Halls. Can only be reached after speaking to Adyr. 9% 3.00 Acquired from defeating Worshiper. 0% 5.00 Located in a chest in the Chamber of Lies, behind a locked door. 3% 4.50 Obtained from Sealed Rune chest in Backside Entrance. 8% 5.00 Located inside a chest in the Catacombs behind a sealed rune door. 1st door on the right when entering from the Graveyard Entrance. 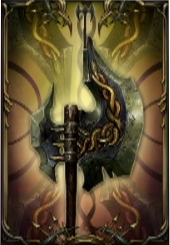 7% 6.50 Can drop from greataxe-wielding human enemies. Usually dropped from Greataxe-wielding soldier in Spire after encounter with Adyr. 7% 4.00 Located in a chest in the Abandoned Range (Abandoned Temple).